Diving deep into one of the films of the year, Getintothis’ Kieran Donnachie offers an intriguing insight into Guillermo del Toro’s award-winning fantasy drama. Outsiders have always been present in Guillermo del Toro’s work, never more so than in The Shape Of Water. An ageing gay man isolated by a disapproving society, a mute woman with scant friends who understand her and of course, the Amphibian Man. These characters are not simply outsiders however, they’re ‘the other’. People to be feared for their differences, demonised to an almost hateful degree. Despite being set in 60’s Baltimore, the characters are timely. Immigrants, the LGBTQ community, disabled people. Each has a counterpart in the film and each is often used as an other in political rhetoric. It is an age old technique used by tyrants and the diplomatically elected alike. Scapegoats for unemployment, strained healthcare systems and even flooding. Justifications for war, the breaking down of basic rights and the division of whole communities. Day by day it becomes an increasingly relevant topic. The ever brilliant Michael Shannon plays the villain, Strickland. He’s a white middle class christian, which has long been held up as your normal American you should strive to be. This subversion isn’t leaned into as much as one would like, but in a del Toro movie it’s certainly no accident. Religion, especially Catholicism, is a common subject his earlier films, as are imperious antagonists he often matches this thread with. The film is bookended with the narrator referring to Strickland only as ‘the monster’ and in true blockbuster fashion he is comically evil. Racist, vulgar and with a lust for violence to boot. The “man is the real monster” concept is a little ham-fisted here and over used in general. Shannon could do with a little nuance honestly, especially when compared to the other characters. While you can place them all in boxes, as I just have, they rise above the cliché and are not to be defined by what they represent. No tokenism or begrudged inclusivity here. The diversity across these characters is core to the film, overshadowed as it is by the homages to Hollywood. Most of the talk around the film has been on this, and with Oscar buzz still fresh it’s a given. Previous darlings like The Artist and La La Land show the nepotistic tastes of the Academy. The message of embracing the different in any shape or form is lost in frenzy to mine for references and flirt with accusation of plagiarism, which Toro deals with gracefully. The themes of acceptance and cinema aren’t disparate ones. This film released the year in which Frances McDormand called for contractual inclusivity, an idea now being adopted by the likes of Michael B Jordan and Matt Damon. It’s difficult not to compare the threads of the films and those of its surrounding reality. Eliza (Sally Hawkins) and Giles (Richard Jenkins) both idolise the Hollywood stars and the filmic worlds they inhabit. They mimic their dancing, wishing for the romance that filled their favourite stories. But Eliza and Giles watch from afar, in the cinema they live above and on the television permanently on in his apartment. Kept separate by the screen. The period setting highlights a lack of progress as much as it celebrates the cinema of old. A black couple are stopped from sitting at a diner counter, Giles is asked to leave seconds later, ‘a family restaurant’. Later Eliza tells the Amphibian Man she loves him, but he doesn’t understand. She imagines then that she’s singing ‘You’ll Never Know’ and dancing with him, like the movies. But the scene fades back to her despondent signing. The world of movies makes no room for her, leaving her unheard and without a voice. 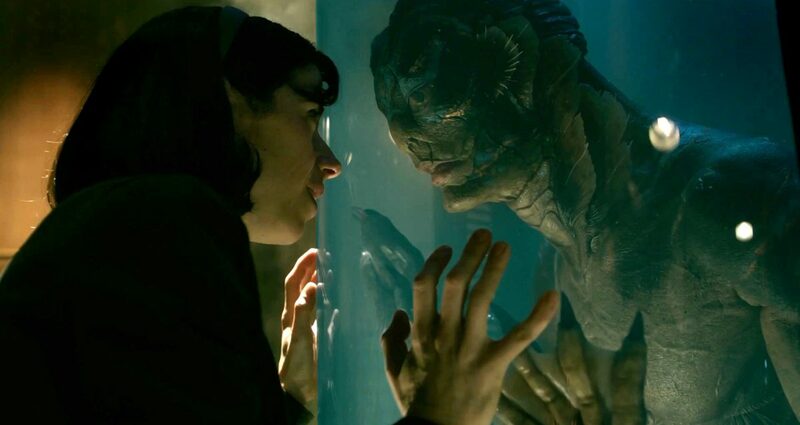 The Shape Of Water is a love letter, but not to Hollywood. It’s to those who dream in film, the people with a vision but no means or opportunity to share it. Guillermo del Toro said as much in his acceptance speech when his film won Best Picture at the Oscars. Drowned out by the patting of backs.